روش غیر محرک روشی نو در تثبیت خاک‌های ضعیف و ماسه­های سست است. این روش نوعی قفل و بست کردن بافت خاک می‌باشد. برای بهسازی موفق به این روش، رسیدن به طول نفوذ مناسب و همچنین بالا رفتن پارامترهای مقاومت برشی ضروری است. تحقیقات گذشته افزایش مقاومت در مقابل روانگرایی و کاهش نفوذپذیری براثر تزریق نانو سیلیکا کلوئیدی را نشان داده است. در این تحقیق، خاک ماسه‌ای در دو حالت خشک و اشباع با 5، 10 و 15 درصد وزنی سیلت تحت نفوذ نانو سیلیکا کلوئیدی قرار گرفت و سپس با انجام آزمایش برش مستقیم پارامترهای مقاومت برشی (زاویه اصطکاک داخلی و چسبندگی) تعیین‌شده است. نتایج نشان می‌دهد که با تنظیم قدرت یونی و خصوصیات رئومتری همچون ویسکوزیته و مدول ژل شدگی، رسیدن به طول نفوذ مناسب و کسب مقاومت لازم جهت انجام تزریق غیر محرک در خاک‌های با درصد سیلت بالا امکان‌پذیر است. همچنین پارامترهای مقاومت برشی افزایش قابل‌ملاحظه‌ای را نشان می‌دهد. Gallagher, P. M., (2000), Passive site remediation for mitigation of liquefaction risk. Ph.D. Dissertation, Virginia Polytech. Inst.and State Uni., Blacksburg. Gallagher, P. M., Mitchell, J. K., (2002), Influence of colloidal silica grout on liquefaction potential and cyclic undrained behavior of loose sand. Soil Dyn. and Earth. Eng., 22: 1017-1026. Thevanayagam, S., JIA, W., (2003), Electro-osmotic grouting for liquefaction mitigation in silty soils. Geotech. Spec. Pub., 2: 1507-1517. Gallagher, P. M., Lin, Y., (2009), Colloidal silica transport through liquefiable porous media. J. of geotech. and geoenvironmen. eng., 135: 1702-1712. Yonekura, R. Miwa, M., (1993), Fundamental properties of sodium silicate based grout. Proc.11th Southeast Asia, Geotech. Conf., Singapore, 439-444. Gallagher, P. M. Koch, A. J., (2003), Model testing of passive site stabilization: A new technique. Proc. 3th Int. Conf. on Grouting and Ground Treatment, New Orleans, 2: 1478-1490. Gallagher, P. M., Conlee, C. T., Rollins K. M., (2007), Full-scale field testing of colloidal silica grouting for mitigation of liquefaction risk. J. of Geotech. and Geoenvironm. Eng., 133: 186-196. Noll, M. R., Bartlett, C., Dochat, T. M., (2007), In situ permeability reduction and chemical fixation using colloidal silica. Proc. 6th National outdoor action conference on aquifer restoration, (443-57), Las Vegas, NV. Persoff, P., Apps, J., Moridis, G. and Whang, J. M., (1999), Effect of dilution and contaminants on sand grouted with colloidalsilica. J. of Geotech. and Geoenvironmen. Eng., 125: 461-469. Hamderi M., Gallagher P. M., (2013), An optimization study on the delivery distance of colloidal silica. Scientif. Res. Essays. 8: 1314-1323. Butron, C., Axelsson, M., Gustafson, G., (2009), Silica sol for rock grouting: Laboratory testing of strength, fracture behaviour and hydraulic conductivity. Tunnel. and under. space techn., 24: 603-607. Taha, M., (2009), Geotechnical properties of soil-ball milled soil mixtures. Nanotechnology in Construction 3, 377-382. Abolhassani, M., (2011), Study of mechanical properties of bentonite stabilized with Nano silica and Cement, Ms.c. 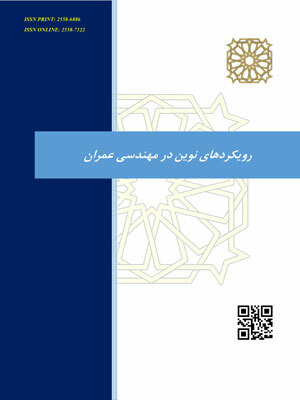 Thesis, KNT University, Tehran, Iran. Moradi, Gh., Seyedi, Sh., (2014), Evaluation of uniform delivery of colloidal Nano silica stablizer to liquefiable sily sand. Int. J. Nano Dimens., 6: 501-508. Moradi, Gh., Seyedi, Sh., (2017), Evaluation of effective strength parameters and mirco structural variations of silty sands stabilized with Nano colloidal silica. J. of Civil eng. and environ., 46: 78-90. ASTM D421-85, (1985), Dry Preparation of Soil Samples for Particle-Size Analysis and Determination of Soil Constants, Annual book of ASTM standards, (reapproved 1998). ASTM D422-63, (1963), Standard Test Method for article-Size Analysis of Soils, Annual book of ASTM standards (reapproved 1998). ASTM-D 854-02, (2002), Standard test method for specific gravity of soil solids by water pycnometer, Annual book of ASTM standards. ASTM D4253-16, (2006), Standard test methods for maximum index density and unit weight of soils using a vibratory table, Annual book of ASTM standards. ASTM D4254-16, (2006), Standard test methods for minimum index density and unit weight of soils and calculation of relative density, Annual book of ASTM standards. ASTM D 3080-98, (1998), Standard test method for direct shear test of soils under consolidated drained condition, Annual book of ASTM standards.